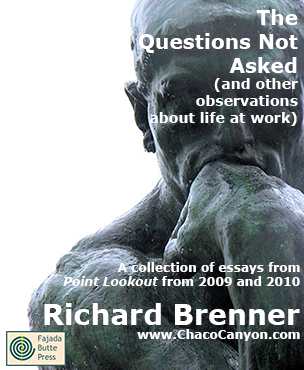 The Questions Not Asked (and other observations about life at work) is a collection of past issues of Point Lookout, my weekly email newsletter of tips, insights and perspectives that help people in dynamic problem-solving organizations find better ways to work with each other. The articles are from 2009 and 2010. The book gives concrete, nuts-and-bolts methods for dealing with real-life situations. The Questions Not Asked is a collection of short articles that give tips, insights and new perspectives on life in the modern workplace. 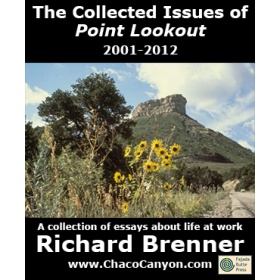 It's drawn from the 2009 and 2010 issues of my newsletter, Point Lookout , and it's filled with the insights you need to make sense of it all. It helps you avoid the traps and pitfalls that await you at work, and it guides you into new choices that can make life at work more enjoyable and rewarding. The Questions Not Asked is in Acrobat format, which gives you several advantages. You can print it, and read it like any book. Or in electronic form, you can use the search capability of Adobe Reader to find passages of special interest to you. If you load it onto your laptop, tablet, or other mobile device, you can read it anywhere — and it's weightless, too. 226 pages.